Remember all those Bitcoin-backed prepaid Visa cards — that suddenly stopped working one day in January 2018? The card issuer, WaveCrest, managed to behave so badly they just got fined £250,000 by Gibraltar. Two US congressmen, one Republican (Ted Budd) and one Democrat (Darren Soto), introduce a pair of bipartisan bills about cryptocurrencies and ICOs. One is about manipulation — but the other is to promote cryptos. Anyone in the US who knows the area want to have a glance over these and write up what they mean and imply, and if there are lobbyist phrases you can spot? Meanwhile, Bitcoin bagholder and US Congressman Warren Davidson plans to introduce legislation to declare that ICO and ERC-20 tokens are not securities. I’m sure that will work out swimmingly for all, e.g. 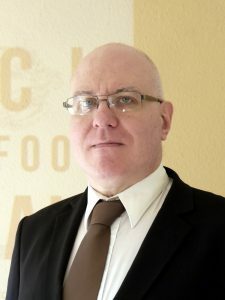 ICO scammers. I am shocked, shocked to hear that an ICO promoter turned out to be a serial scammer! Shaun MacDonald, who led the $31 million Blockchain Terminal ICO, was, in fact, convicted hedge fund fraudster Boaz Manor. 24 ICOs raised $2.8 billion with almost zero current trading volume. The crypto crash is leaving a wake of bankrupt startups! Oh no, whatever shall we do. Even Ethereum Classic has lost Barry Silbert’s support. That said, the Ethereum blockchain is around a terabyte. So, the Ethereum distributed app system has duly centralised around Consensys. I think the way forward with transaction speed is for Ethereum to just admit it’s centralised. Desperate for trading volume, Coinbase is looking seriously at adding about thirty questionable altcoins to their exchange. The OmiseGO ICO, an offshoot of Thailand payments fintech Omise, was going to do a crypto-based payments network. It was the first Ethereum ICO to reach a $1 billion market cap! Captain Altcoin writes up the complete and hilarious catalogue of failure and crookedness: Disaster called OmiseGo (OMG): lackluster performance, overpromising and underdelivering — epitome for the whole altcoin world. I would have been proud to post this article. See also the writeup from one aggrieved hodler, on Reddit /r/omise_go. Amy Castor has written an excellent article on what the BitMEX not-an-exchange (actually a derivatives bucket shop) does, and how it does it. The biggest-ever Bitcoin options bet is about to expire worthless. Ari Paul bought the bet on Bitcoin hitting $50,000 in December 2017 to hedge a sale of bitcoins. Real-life adoption! Singapore police say that at least SGD$78,000 was stolen in a Bitcoin fake news scam. Without their knowledge, local celebrities were portrayed as being supporters of Bitcoin. 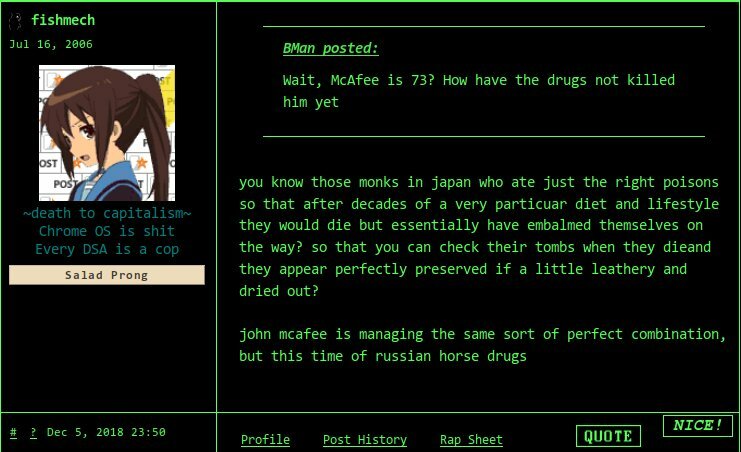 Bitcoin Magazine retreats to Bitcoin-only. When a cult is failing, retreating to reactionary fundamentalism is a common strategy. How’s blockchain in shipping going? This piece in the Journal of Commerce (archive, archive) advocates the use of smart contracts in shipping as a way to get blockchains accepted … then literally ends with an example of how, in real life, contractual clauses often aren’t enforced if they’d damage the human and business relationships. FT Alphaville’s crypto charting crime of the week — comparing a price to a ratio, on two Y-axes, one linear and one log-scale. Jemima Kelly, FT Alphaville: A “fintech sandbox” might sound like a harmless idea. It’s not. Also — is “asset” even the right word for cryptos? Jake Chervinsy posts a great Twitter thread on why the SEC will keep rejecting Bitcoin ETFs until the market is not a sea of blatant manipulation. Larry Cermak in September: “The sheer amount of misinformation regarding the situation in Venezuela made the choice of research topic for this week’s Diar Newsletter easy. Showing volumes in Venezuelan bolívar, one of the fastest inflating currencies ever? Really?” I’ll repost this inside look from a local crypto fan about the situation in Venezuela. A video’s been going around of crypto mining operation Digital Gold shutting down in despair. Here’s an apposite Twitter thread from William Pietri. Why do we take EOS seriously when it’s a plutocracy? Because number go up, of course. Centralisation is always more efficient financially than decentralisation — which is why Bitcoin’s decentralisation, which attempted a judo move on the nature of capitalism, was always doomed. See also this Twitter thread. Here’s a great “why you shouldn’t put it on a blockchain” talk by Eerke Boiten. The bit from 13:21 is why it’s a bad fit for the provenance use case — because your threat model is fraud. Try the GetRichQuick free ICO generator! When moon? Hurry, hype is drying up! Arjun Balaji: “I wonder if the institutional investors looking at allocating to crypto realize the ‘top’ fund managers have spent hours on Telegram this week analyzing the legitimacy of claims made by a woman from Burning Man who predicts the return (and sale) of Satoshi’s coins next month.” Here’s the video. It’s … remarkable. 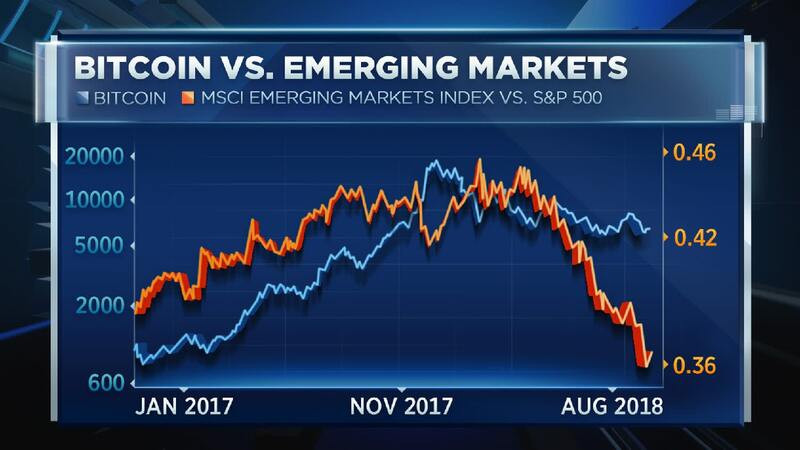 CME’s Bitcoin Futures Are Poisoning Crypto! How to remedy this? “It will take a total collapse of the dollar to free gold and Bitcoin from this highly coordinated, top-level, worldwide market manipulation.” … OK. RIght you are then. The “right way” to view cryptos is “as lottery tickets that pay off in a dystopian future where they are used in rogue and failed states,” says economist Kenneth Rogoff. CoinDesk put this in their email newsletter as what’s passing for good news for Bitcoin these days. Grim meathook Mad Max petrolpunk future now! IOTA is making friends on Wikipedia again. I’m probably not going to write an article myself — I have more than enough to be getting on with — but if I did, the FT Alphaville article is the sort of “Reliable Sources” coverage I’d be using. Here’s Liberal Party of Australia Senator — and (the only remaining?) member of the Parliamentary Friends of Blockchain group — Jane Hume, to enlighten us all as to the key benefit of this exciting new technology: Blockchain to improve Australian government efficiency by centralising databases. Just like it said in the white paper. Cas Piancey from crypto Twitter is writing a book about our boi, Tether. Number five by market cap!! I’m currently working on a review of Life after Google: The Fall of Big Data and the Rise of the Blockchain Economy by George Gilder (US, UK). It’s an odd book, and bits will only make sense if you realise the author is literally a creationist, and the co-founder of the Discovery Institute. Anyone else in blockchain land read this? For what it’s worth — US government figures show the popularity of crypto doubling between 2014 and 2016!
. 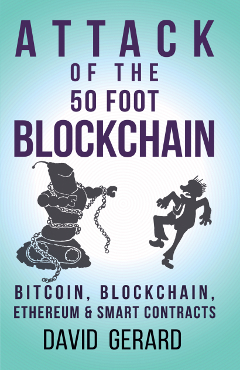 @davidgerard’s “Attack of the 50ft Blockchain” is one of the very rare tech books to age like fine wine. Published in the heady days of mid-2017, it somehow manages to discuss the second crypto bubble with the detachment of a historian writing about Tiberius Caesar. Apparently we're at Blockchain 3.0 already. Any time someone asks why you won't put skin in the game ask yourself why they want your skin in their game.